The data has underlined that the nationwide scenario today is far worse than what it was in 2008 when 37 per cent of Class 5 students could work out basic mathematics. It might be comforting to reflect that a direct outcome of the Right to Education Act has been the dramatic increase in enrolment. On the surface, this would suggest that fewer students are dropping out, despite the irregular and occasionally fatal midday meals. Well might this be a cogent reason for the Bharatiya Janata Party government at the Centre to preen its feathers in the season of elections. Data furnished this week says 97.2 per cent of children in the 6-14 age group are enrolled in schools. 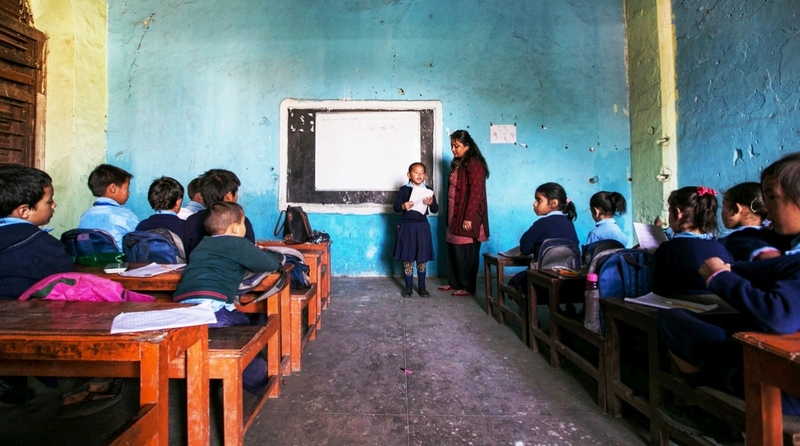 The legislation has also given an impetus to the education of girls ~ 95.9 per cent of girls across the country are attending schools, with or without cycles as in West Bengal’s Junglemahal. At another remove, several other facets of the data are deeply distressing. This is the bitter irony of what masquerades as the search of learning in India today. As for instance the finding that 72.8 per cent of children in Class 3 cannot read a book that is prescribed for Class 2. The breathtaking ignorance is not confined to the primary level; it beggars belief that 27 per cent of Class 8 children cannot read a Class 2-level text. Nay more, 56 per cent of Class 8 children cannot work out a simple division in arithmetic, notably to divide a three-digit number by a single digit. Seventy per cent of Class 3 students cannot do any subtraction. Clearly, both reading and arithmetic have suffered to an incredibly atrocious degree. It might be tempting to labour the obvious ~ for whatever reason, the children fail to assimilate what they are taught. More to the point must be that a fairly large section of teachers lack the wherewithal to teach. This has compounded the absurdity of the teacher-student ratio in schools of rural India, not the least in West Bengal where the appointment of interns for two years and on a pittance is at best a quick-fix initiative that doesn’t quite inspire optimism. In the net, more children are going to school but learning languishes almost at the sub-literate level. The data has underlined that the nationwide scenario today is far worse than what it was in 2008, when 37 per cent of Class 5 students could work out basic mathematics. State control of economic and social matters has failed in the sphere of education as it has in terms of poverty alleviation. This is the tragedy of learning that the orchestrated flagship called the RTE Act has not been able to cope with. As critical as the child’s assimilation is the standard and effectiveness of the instruction. In a vast swathe of schools, the teachers are perpetrators and the taught are the victims of sub-standard instruction. This succinctly is the tragedy of learning.